If you've been following the news about Target's newest designer collaboration with New York-based jewelry designer Eddie Borgo, then you probably know that his collection of customizable jewelry and accessories launches at over 700 Target stores on July 12. (See where to buy it right here and read my Eddie Borgo for Target review here.) Given the fresh wounds of many people who tried to shop the Lilly Pulitzer for Target launch in April, I'm willing to bet that many shoppers won't have enthusiasm for this collection if they think the launch will be plagued by the same problems as the Lilly for Target collection. Let's hope that demand won't reach Lilly levels, and the Target website won't be riddled with "technical difficulties." What's cool about this collection? The Eddie Borgo for Target collection differs from past designer efforts because it can be personalized, and it's inspired by craft culture from the '60s and '70s. It sounds like it's time to unleash some creativity for some fun D.I.Y. projects! Think studs, beads, totems, and charms that you can use to create one-of-a-kind looks on bags, necklaces, bracelets, and earrings. So your #EddieBorgoforTarget pieces won't look the same as everyone else's! Prices range from $7.99 to $49.99, with everything from galaxy print bags and wall art to geometric shapes and rose gold hues. Below, a selection of my favorites. Taking into account the crazy Lilly for Target launch and the new lessons I learned, here are my thirteen tips for how to shop #EddieBorgoforTarget. 1. Know where to go. Once the collection has launched online, and assuming Target's site is functioning properly, you can use Target's "find item in store" function to search for specific items in stock in your area. It's not always accurate, but it can be helpful to help you plan your shopping. Be ready to stand in line on Sunday morning, although I seriously doubt that the lines will look anything like the Lilly launch. Use the store locator to find stores near you. 2. Phone it in. The Eddie Borgo collection will be sold in 700 select Target stores nationwide, instead of in every store like the Lilly for Target line. Call your local stores the week before the launch to see if they'll carry the collection. Get your local store's phone number here. 3. Be an early bird. You know what they say about the early bird. My Target stores open at 8am on Sunday, and I've found in the past that if I arrive by 7:30, then I'm able to get what I want, since there aren't crowds in my area. For people who live in large cities, I'd recommend going one hour before the store opens if you're really motivated. For shoppers in more suburban or rural areas, the competition and crowds are reduced, but the selection of goods may be as well. In my experience, stock varies widely from store to store. Sometimes metropolitan area stores and stores in higher income neighborhoods carry a better selection of merchandise. 4. Bring a buddy. A family member, friend, or significant other might be able to help you get the pieces you want and help you make purchasing decisions. Divide and conquer! The Jason Wu for Target cat tote would not be mine if not for a dedicated boyfriend. I may or may not have bribed him to shop with me in exchange for Sunday brunch. 6. Persistence pays off. Target does not restock these collections, but you can still score your favorites. If you don't find what you want after the launch, check back for returns in the coming days and weeks, as many shoppers take items back to the store. Ahem, buyer's remorse! Don't forget to check the customer service desk and clearance racks for returns as well. (That is if it doesn't get bought in bulk and hoarded the way the Lilly collection was.) Call your local stores to ask what they have. The best part about returns? Online exclusive items are heavily discounted when returned to stores, leaving the door open for other persistent shoppers to get really lucky. After four or so weeks, the collection will be discounted to 30% (and eventually to 50% or 70%) off, so frequent visits to Target after the launch could really pay off. 1. Learn the lookbook. Study the lookbook to select your favorites, get D.I.Y. inspiration, see what's online only, and check the prices. 2. Play favorites. Make a list or collage of your favorites to help you stick to your budget. The good news is that the most expensive piece in the collection is $49.99. 3. Know when and how to shop. Since Target's collections debut on Saturday night or early Sunday morning, be prepared to stay up late or get up early (depending on your time zone) in order to shop online. 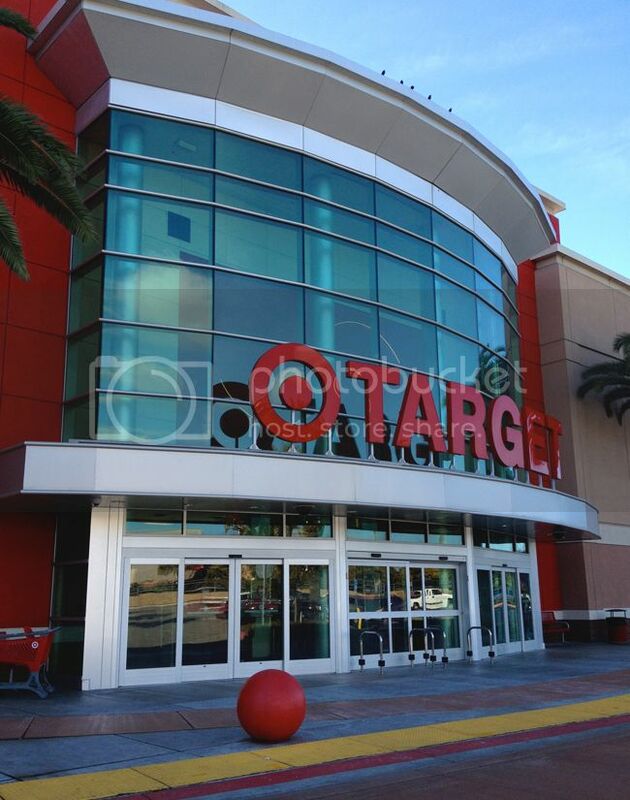 Target doesn't designate or announce a specific time to launch the collaboration online. Join me on Twitter on Saturday night around 8pm PST for the pre-launch. It's where you'll want to be. Be extra prepared by using more than one web browser, mobile device, etc. I use Chrome and Safari, and I have had more luck with Chrome and with mobile shopping. Refresh often and have patience. Items tend to pop up and then disappear during the initial launch. Expect some glitches but don't give up. Remember, persistence and patience are key, and you may have to sacrifice some sleep. Cross your fingers that Target's site won't have technical issues. 4. Save your info. As the time to shop online approaches, log onto Target.com and have your checkout and payment details saved ahead of time. This makes for faster checkout process and reduces the chances of having your cart emptied before you can click the "complete order" button. Why get a RedCard? Target RedCard users enjoy free shipping, an extra 30 days to return certain merchandise, and a 5% discount on purchases. Sweet! 6. Stay social. 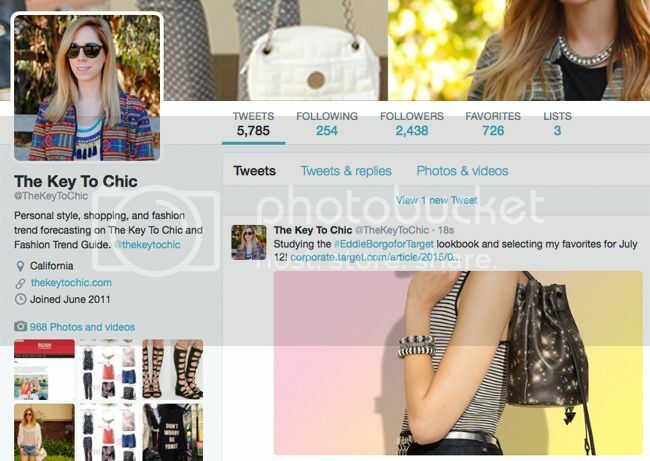 Use social media channels such as Twitter and Instagram for #EddieBorgoforTarget shopping updates, product info, and to connect with other shoppers. Sign up for Target's email updates. 7. A little birdie said. Wanna be the first to shop the collection online? 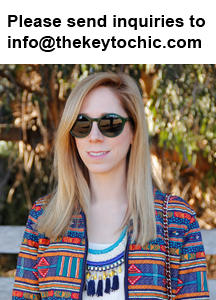 Follow me on Twitter, Facebook, and Snapchat (@thekeytochic). Please join me on Saturday night at 8PM Pacific time (and early Sunday morning) on Twitter and Facebook to get tips, ask questions, share your excitement, and to be the first to shop the collection. Happy shopping and best of luck! July 12, 2015 update - read my Eddie Borgo for Target review with shopping information and D.I.Y. ideas.